What Should Be Included In an On-site Health Fair? Synergy Safety + Health > Safety Center > What Should Be Included In an On-site Health Fair? And What are the Employee Benefits? Employee wellness can have a tremendous effect on the performance of a company as a whole, and businesses across the country are embracing the idea that a healthier workforce is more productive and more profitable. Hosting on-site health fairs are becoming an increasingly popular way of raising awareness about job-based risks and individual health status. By providing an opportunity for employees to receive information, educational resources and suggestions for healthier living, a well-planned health fair can be a proactive way to assess, manage and maintain the health and wellness of your employees. Planning is the most important element in coordinating an on-site health fair. 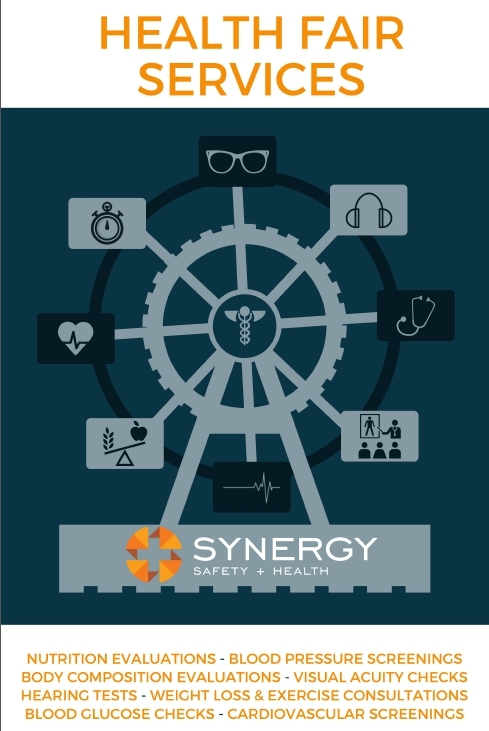 Synergy Safety and Health will work with your planning team to ensure your health fair is a success by developing a customized program designed to meet the specific needs of your company. Nutrition Evaluations: A registered dietitian is available to answer questions on topics such as fat grams and herbal supplements. Blood Pressure Screenings: Determine blood pressure numbers, what affects these numbers and how to control them. Body Composition (Percent Body Fat) Evaluations: Evaluation to determine and provide feedback on body fat, muscle mass, body water, metabolic rate and ideal weight. Visual Acuity Checks: Employees receive a basic vision test to detect any visual abnormalities. Hearing Tests: Employees receive a basic hearing test to detect any hearing loss. Weight Loss and General Exercise Consultations: Health and lifestyle evaluation shows employees how changing their habits can improve their quality of life. Blood Glucose Checks: Employees receive the results of a simple finger-stick test. Cardiovascular Screenings: Tests performed by a registered vascular tech and interpreted by a board-certified vascular physician. Synergy’s team of experienced nurses and health professionals are available to assess and evaluate the overall health of your workforce, and based on their findings, they can then educate employees on the risks associated with their current behaviors as well as provide them with a range of educational tools and resources on good health and wellness. Routine wellness and health services have been proven to boost attendance, interaction and improve the health of your employees, and hosting an on-site health fair is just one way you can help your employees to maintain good health and establish healthy habits. For more information on how Synergy Safety and Health can help you reduce incidents and injuries and maintain productivity and company morale through an on-site health fair or health services, visit www.SynergySafetyAndHealth.com or call 985-686-7070. The experts at Synergy Safety + Health offer helpful and timely tips for keeping your team healthy and productive. Read More. Copyright © 2019 Synergy Safety + Health. All rights reserved.